Are you passionate about your pets? A love of animals, trustworthiness, and consistent availability can be signs that you could be successful in starting a pet-sitting business. Pet sitters typically are available during normal business hours, weekends, and holidays to take care of animals by taking them for walks, feeding them, cleaning their cages, and more. 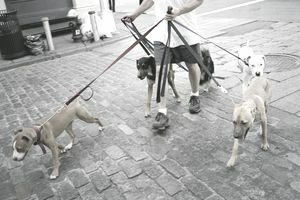 Relatively low start-up costs: You'll need some basic pet supplies, but in most cases, pet owners will have their own supplies, such as leashes, that they and their pets prefer. No storefront is needed: Your base of operations likely will be your home and the vehicle you use to travel to your clients, and most of your work will be done at your clients' homes or in the public areas where you take their pets. You can deduct expenses for your home office when you file your taxes. You can turn your love of animals into a business: If dogs, cats, and other household pets are a passion for you, this is a great way to earn money doing what you love while sharing your expertise with your clients. You can work as much or as little as you want: This can be a side job to earn extra income, but if you build up a large enough client base, this could be a full-time job. The average price for a single pet visit is about $16, according to the ​National Association of Professional Pet Sitters. There is a wide range of potential clients and many ways to reach them: Selling services to neighbors might be the easiest way to get started, but you might also be able to build a client base by establishing a relationship with area pet stores and veterinarians. The job is a great way to inject plenty of exercise into your daily routine. More than just a love of animals is needed: While no formal training is specifically required, you have to have enough knowledge and experience to handle multiple pets, breeds, and animal temperaments. Some organizations offer certifications you can earn to help market your knowledge and experience. A higher than average level of physical fitness is a must, especially if pursuing this as a full-time job. The last dog on your schedule isn't going to care how many miles you've already put under your feet that day—nor, for that matter, will the pet owner paying you for your services. You will need insurance and/or bonding to protect yourself from liability. You need to be flexible with your availability: Clients frequently will need your services on weekends and holidays when they are out of town or have other plans. You also need to have a policy in place for short-term emergencies. Will clients be able to contact you at odd hours if they have their own out-of-town emergency and need to make immediate pet-sitting arrangements? You need to have a policy for handling pet emergencies and you should have some basic pet-related first-aid skills.